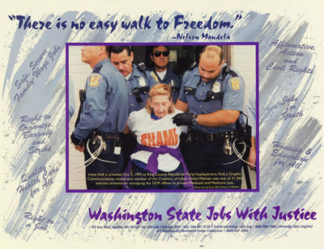 Northland Poster Collective (RLM was a member) created this large poster with Washington State Jobs With Justice. It features an image of one of their activists arrested while protesting Medicaid/Medicare cuts. The quote by Nelson Mandela, “There is no easy walk to freedom,” tops the poster.